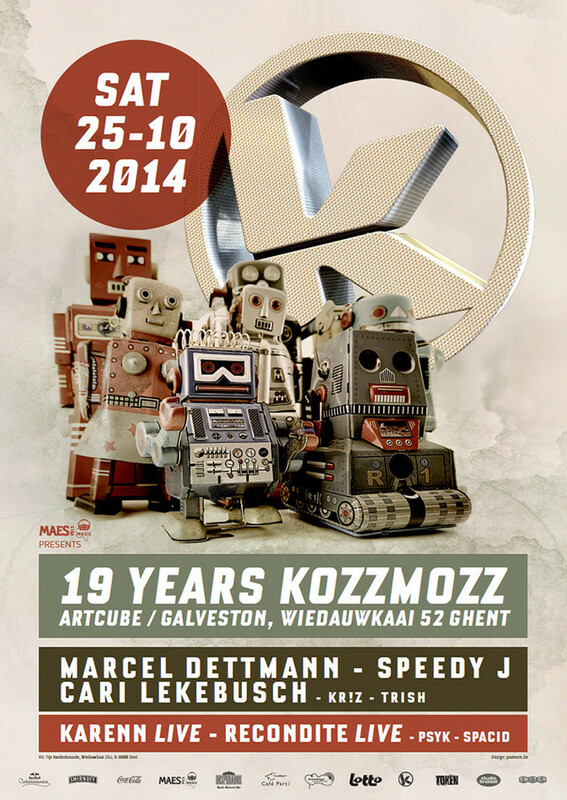 Kozzmozz’ last year’s birthday edition at the Galveston venue was out of this world. We showed that techno is alive and kicking in two units. The place was completely filled with techno lovers from all around the universe. They say good news travels fast, well the news about this mind-blowing techno fest travelled at light speed through galaxies far away. And now … we’re back to keep this deep space tradition alive. For this edition a convoy of intergalactic robots is coming to our galaxy. Their latest message told us that they’ve charged their batteries and now they’re full of energy. Their mission on our technologic techno sphere is to bring you supersonic ecstasy. So brace yourself, because we’ve invited some rather pleasant visitors. At your service on this new intergalactic mission are some established robots and some new droids who all have one thing in common: Techno! The biggest droid on Unit DS9 is without a doubt Marcel Dettmann who has been reshaping techno as resident of the trendsetting Berghain club since day one and with the release of two groundbreaking albums on the clubs Ostgut Ton label. Next to that, he also runs his own MDR label hosting releases that blow people away time after time. He’s been visiting us a couple of times the past few years and we’re very happy he will join us again on this special B-day flight. Another established bot is Speedy J. Together with Laurent Garnier, Aphex Twin and Richie Hawtin, he helped define techno since 1991 with albums like Ginger, G Spot, Public Energy No. 1 and Loudboxer – spearheading labels like Plus 8, Novamute and Warp. His latest projects span the audio-visual pioneer work of Umfeld, his label Electric Deluxe and his event series Electric Deluxe presents. Next to recent collaborations with Chris Liebing and Gary Beck, there’s now also the album ‘Zeitgeiber’ which Jochem Paap made with Lucy, label-manager of the revered Stroboscopic Artefacts label. Speedy J first joined our space-flight in 1999 so this is the 15th anniversary of his first performance on Kozzmozz. Cari Lekebusch is one of the key ambassadors in exporting techno beats that proliferated from his homeland, a term which was then aptly coined by many as ‘Swedish Techno’. His repertoire includes releases on Swedish imprints such as Drumcode, Code Red, Truesoul, Jericho and Corb, plus tracks on other prominent labels such as Novamute, Soma, Primevil, Masters of Disaster, Fine Audio Recording, Harthouse and Turbo to name a few. He’s not a newcomer on Kozzmozz either and we know why! And then we have another Kozzmozz favourite, be it from a long time ago. Trish joined us on the very first Kozzmozz voyages when our ship was still a real ship. Her performances are unscripted and unrehearsed. Be prepared to be transported from the dance floor to a world of pulsing, freeform techno. Internationally acclaimed and respected, Trish Van Eynde remains uncompromisingly true to the music she loves as to create her own brand of music for the third millennium. And she doesn’t only do this as a dj. but also as label-manager of Electric Art and producer for Subject Detroit, Motorcitysounds and more. And no Kozzmozz flight without our own star off course. Kr!z’ Token label is brighter than ever and can count on universal recognition with over 40 releases to its name including several well received album projects and is being played by techno lovers and players all over the world. On unit DS7 we are taking our techno explorations further and deeper into unknown realms with androids that have popped up in recent years and immediately left an ineradicable mark in the evolution of techno. Karenn Live got formed in 2011 when Pariah and Blawan, both of R&S fame, joined forces and traded in their computers for analogue gear. After a few releases on their imprint ‘She works long nights’, they decided to take all their machines on the road. The first performances at Fabric in London and Berlin’s Boiler Room, convinced the crowds and now they keep exploring the endless possibilities their gear has to offer in select shows around the world. Now, they are coming to our Kozzmozz galaxy with this strong piece of live work. Another recent revelation in techno-land is Recondite who caught the eye of Scuba after 3 great releases on his own Plangent records in 2011. He went on to produce for Hot Flush and more recently Dystopian and Innervisions Records. He’s picked up by the biggest in the scene such as Richie Hawtin who regularly books him on his Enter parties in Ibiza and shows as Minus Pollerwiesen and more. We’re looking forward to see him bring his exquisite live show on 19 Years Kozzmozz. Third international android is PSYK who signed his first release on Richie Hawtin’s Minus label when he was 19. He went on to produce a series of EP’s for labels such as Figure, Non Series, Drumcode and CLR to name but a few. This year he brought us his first album ‘Time Foundation’ on Luke Slater’s Mote Evolver. He’s definitely a rising star on the techno firmament. The voyages into the newer sounds will be supported by resident Spacid who will perfectly tune into their trajectory. We are the robots and jub ill ee amaze amaze!